Um, OK, let’s have a chat. About sweet breakfasts. Are you a fan? 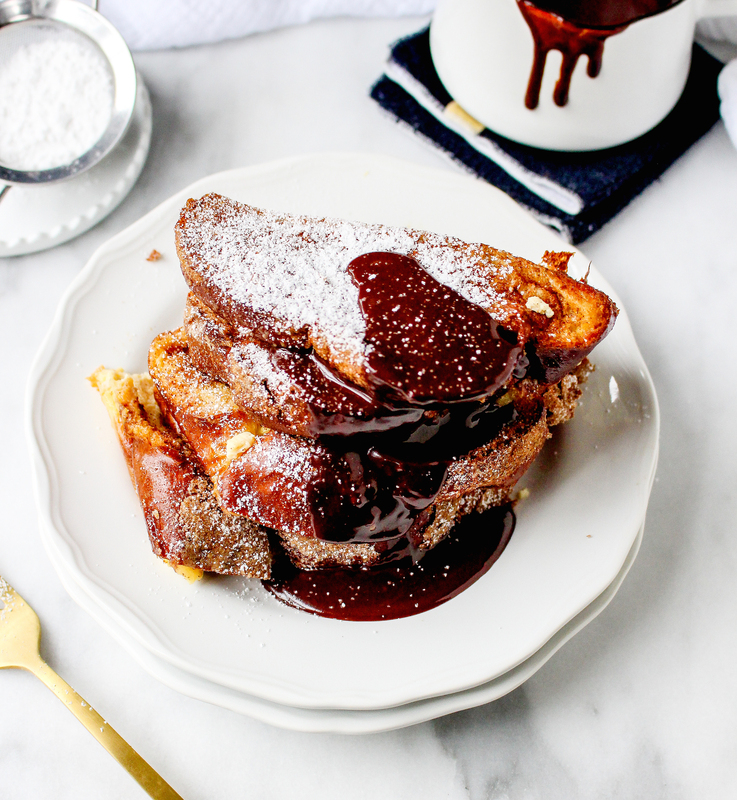 Is French toast your breakfast or brunch go-to? Do you swoon at the sight of maple syrup cascading down the sides of that pancake stack? Or the pillowy clouds of whipped cream that cover the entire surface of that waffle? Or are you more like me and prefer savory breakfasts over sweet almost 100% of the time? Every now and then, I crave something sweet in the morning, but it truly is rare. There’s something so enticing about a warm fried egg with buttery toast early in the morning. It makes me forget allll about the waffle/pancake/French toast options. Until now. 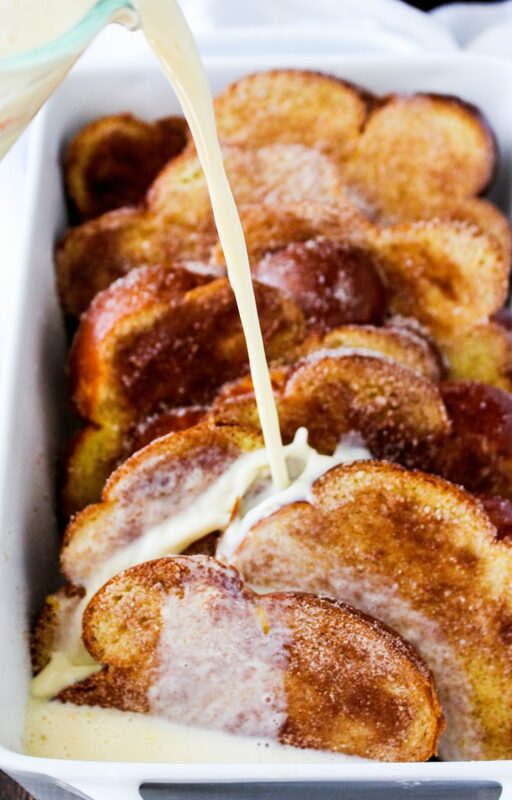 My eggs and toast have some competition with today’s baked French toast. Big time. And here’s why. I’ve said this 487247183 times before, but I am a texture freak. I can’t stand when something is all one texture. Too mushy. Too crunchy. Too soft. Too hard. No. I’ll not stand for it! I need something crunchy on top of my creamy soup. And I live for the crunchy streusel on baked goods. I need the contrast to be satisfied. 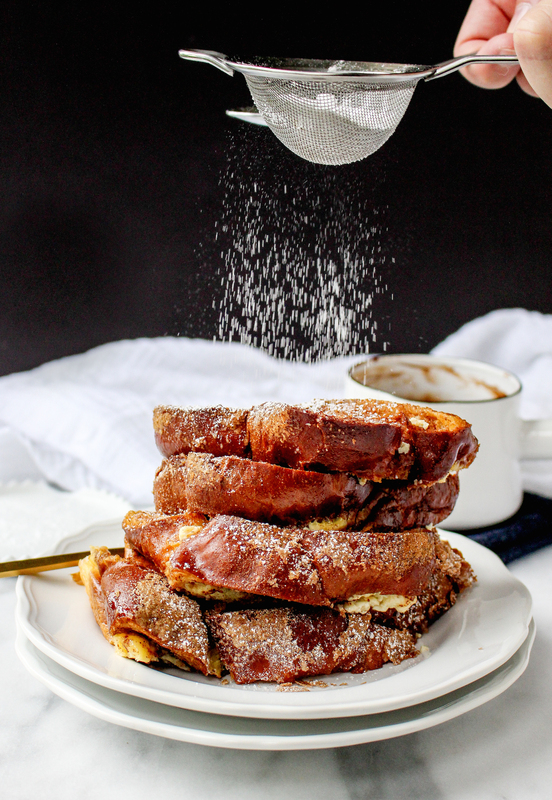 This churro French toast fits the texture requirements perfectly. Churros are, in fact, soft and doughy on the inside and crunchy and sugared on the outside. That’s exactly what I was going for here. I used challah bread, which is just the best thing ever when it comes to a carb. It stays soft and pillowy on the inside but crisps up beautifully on the outside. It’s buttery, eggy taste makes THE BEST French toast. Seriously. And the spiced sugar crust that I put on the outside only helps my texture freak tendencies. I want to sprinkle it on ALL THE THINGS. There are more than a few great things about this recipe. One: you can make it a day (or days!) ahead of time. It sits in the fridge, waiting for you. Two: it really tastes like a fried churro. Three: it also tastes like French toast. How? I don’t know. But it just does. Riddle me that one. And last but not least: it’s served with a seriously decadent, slightly spiced chocolate sauce!!! Chocolate for breakfast is definitely something I can get behind. See ya, eggs and toast! 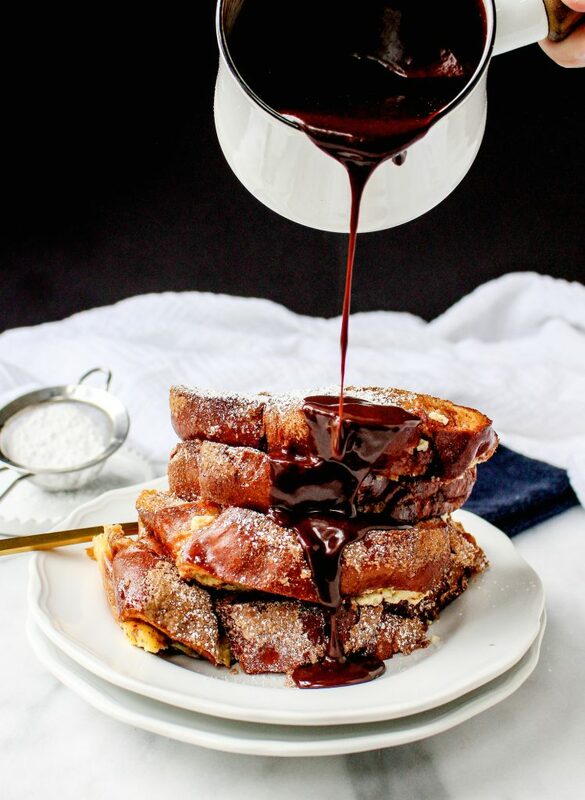 This chocolate sauce is made with Mexican chocolate. I buy mine online, but I’ve heard that you can create your own by spicing up some regular dark chocolate with cinnamon and chile. I choose to trust the experts on this one (aka, take the lazy route), but have at it! Mexican chocolate is deeeeeeelicious stuff, guys. And it melts beautifully! 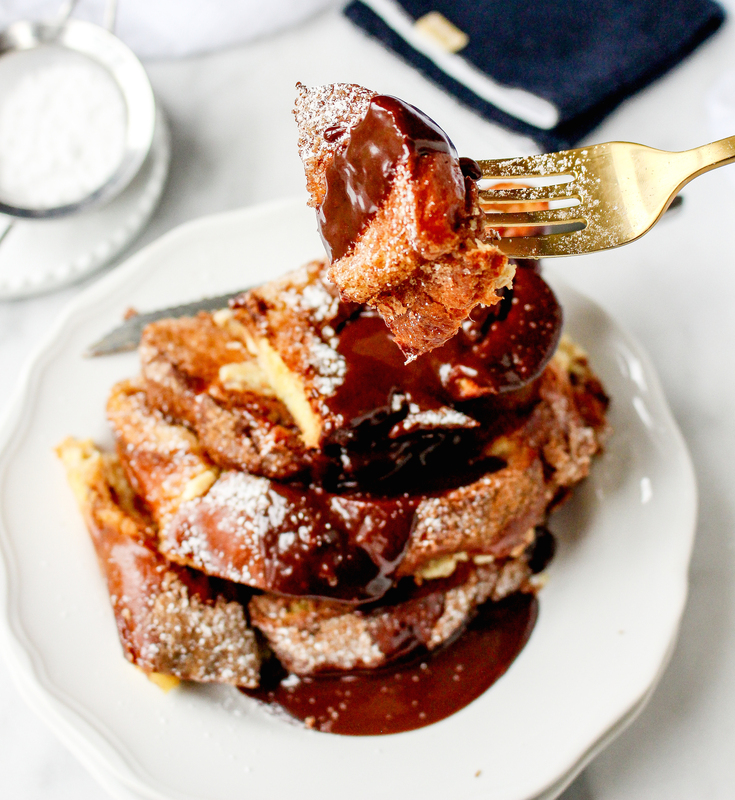 For pouring over our churro French toast! It is a swoon-worthy start to the day. 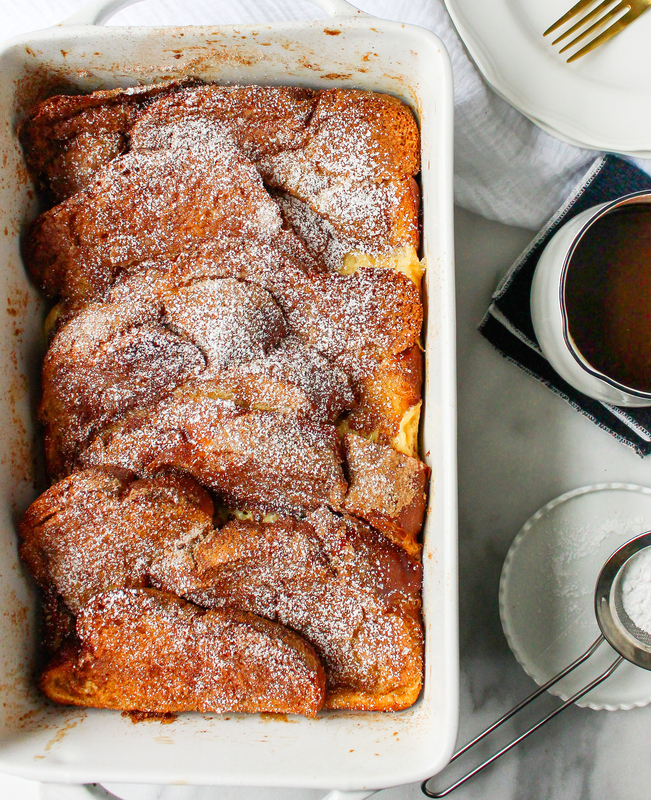 Baked French toast is not only super easy to make (with a little planning), but this one goes almost TOO well with a hot cup of coffee. All my texture needs are met. There’s spiced sugar involved. AND chocolate for breakfast. 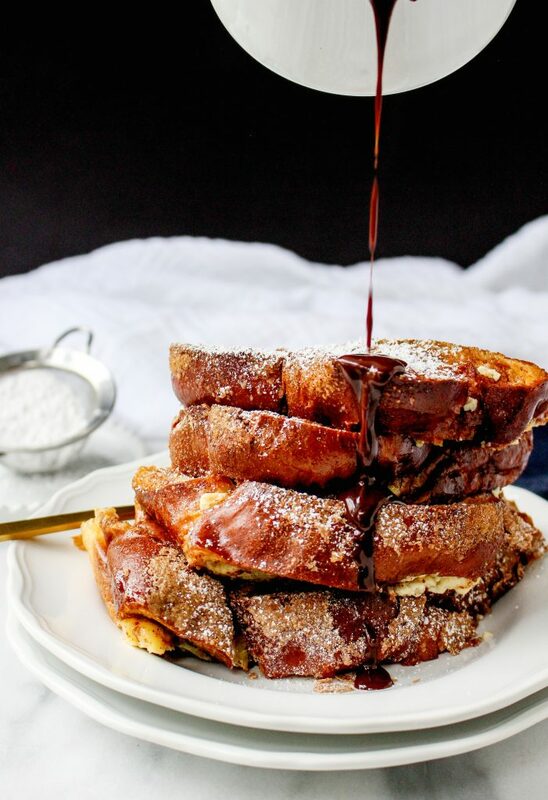 It is seriously a French toast fiesta up in here. Whisk together the sugar and spices until well combined. Use half on the bread before allowing the casserole to “soak” overnight and reserve the other half for sprinkling on just before baking. At least 8 hours before you want to serve (I often make this the night before so it can set in the fridge overnight), brush some of the melted butter in a large baking dish. Place half of the spiced sugar mixture in a shallow bowl or plate. 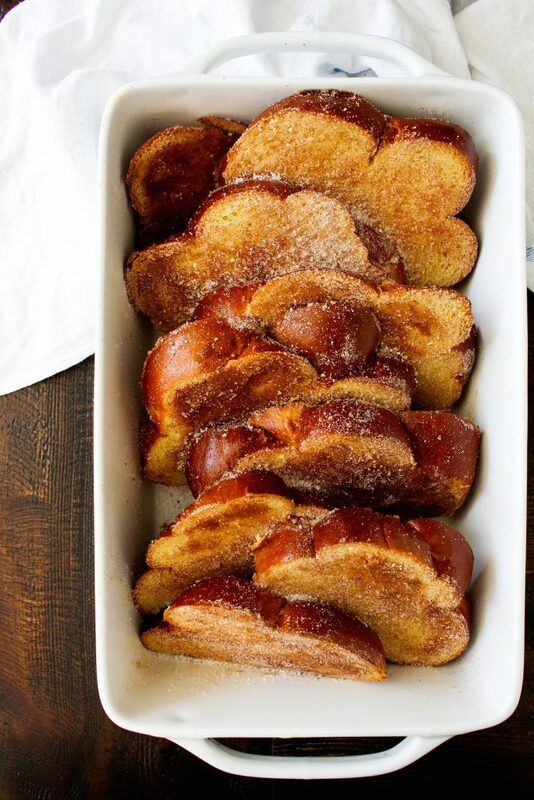 Brush the remaining butter on each side of each challah slice and then dip in the spiced sugar, turning to evenly coat both sides of the bread. Place the coated bread slices in the buttered pan, arranging them in as even a layer as you can. Whisk together the eggs, milk, vanilla, and salt in a bowl. Pour the mixture over the bread in the pan, pressing the bread gently down to coat them. Wrap the baking dish with plastic wrap and place in the fridge for at least 8 hours. After 8 hours (or the next morning), remove the baking dish from the fridge and let it sit at room temperature for 30 minutes. Preheat the oven to 350°F during this time. Remove the plastic wrap from the baking dish and liberally sprinkle the remaining half of the spiced sugar over top of everything. This will ensure a crispy sugar crust after baking. Bake for 35-40 minutes, or until the custard is set and the bread is golden and crisp. Allow to cool slightly in the pan before serving, drizzled with the Mexican chocolate sauce. While the casserole is baking, place the cream in a small saucepan and bring to a simmer. Meanwhile, chop the chocolate and place it in a heat-safe bowl. Pour the hot cream over the chocolate, let it sit for a few seconds, and then whisk until smooth and melted. Whisk in the vanilla. 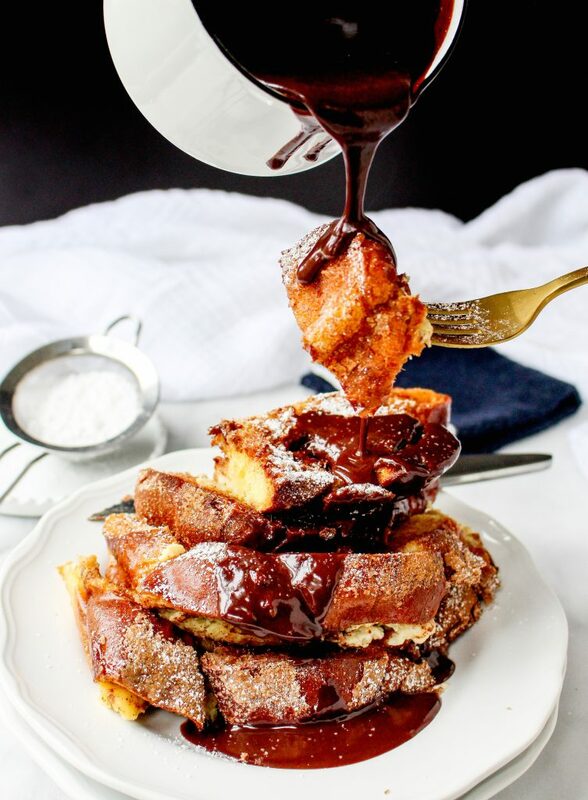 Serve the French toast warm with the chocolate drizzled over top. 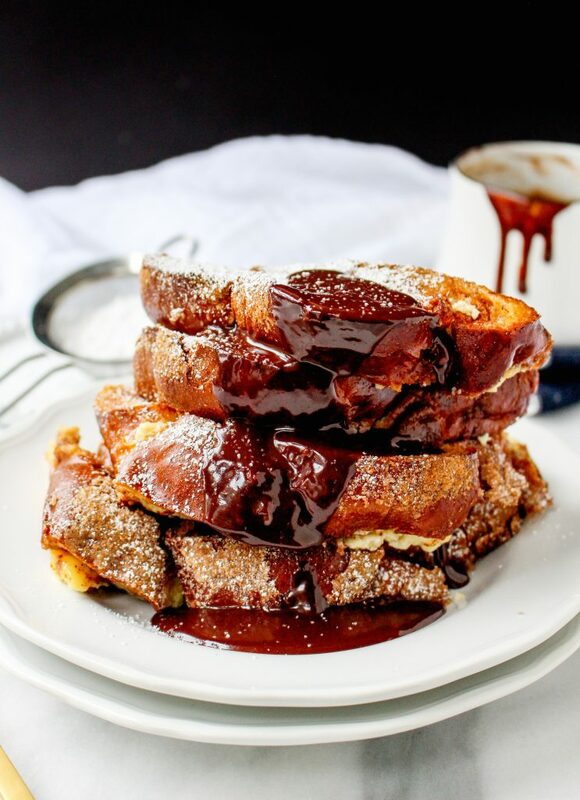 Serve additional chocolate sauce on the side. Holy smokes, that drizzle!! This sounds incredible! Making this for a brunch I am hosting today. So easy and so rewarding ? I love breakfasts you can put together the night before! Hope you love it! It is pure decadence, which makes it perfect for brunching! Can you use French bread instead of Challah? Hi Dolores! I’m sure that would work fine! Do you think I could add some softened cream cheese to the custard mixture? How would that affect it? Hi Julie. I think if you added a little bit (like maybe a few tablespoons?) of cream cheese to the custard, it would work out OK. I worry that it might make it too thick, but I’m not sure because I’ve never tried it. If you do, let me know how it turns out! Molly, I ended up just sticking the cream cheese in between the pieces of bread, because I was afraid of messing up the custard. I think it turned out great like that though!